1993. Channel Islands/Al Merick Thruster 6ft 10". 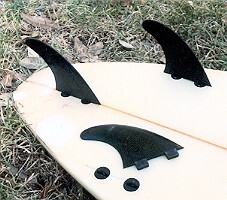 Foam blank, 1/8'' three ply wood stringer, fibreglassed, spray, FCS fin plugs, right hand leg rope plug. 9 1/2?inch x 8 1/2? inch base to fit plugs. 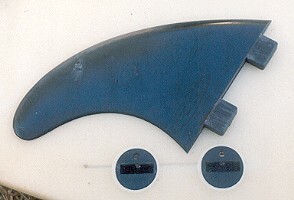 Image right, showing plugs and fin base lugs. Three large blue hexagons with text 'Santa Barbara Calif USA' on nose. See Image right top. Large black script and text 'Shapes and Designs AL MERRICK' Sweet spot on left rail. Image , right. Three large blue hexagons with text 'Santa Barbara Calif USA' on nose. 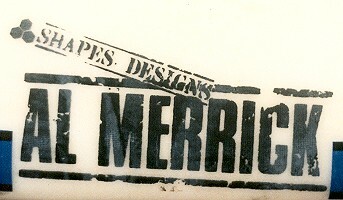 Large black script and text 'Shapes and Designs AL MERRICK' Sweet .spot: Left rail.
' 6'10 - 19 1/4 - 2 9/16 / CIA 7053 and fish symbol ' pencil on stringer at tail??? Bottom: Clear. Black rubber nose guard. Donated by John McInnes, origin unknown. Severely damaged with one of the most inept nose repairs seen.